Sunday Aug 11, 2013 – Prius Plug-in First Year – It’s hard to believe but it has been a year since Dianne Whitmire first gave me a ride down to Carson Toyota to pick up my PIP. Overall I have to say that I really like this car. Is it perfect – No, but it works well for me and if it works well for me it will work well for others. Since getting the PIP in August, 2012 I have logged a total of 5191 Miles. The display says that I have achieved overall fuel consumption of 65mpg at an average speed of 17mph. Most of this was done with a daily commute of about 9 miles each way and charging approximately twice per week. It also includes two road trips with an average of about 96 miles each way. Now my situation has changed and my current client is only 1 mile from home. I filled up my car at the end of May and since then I haven’t needed to visit the gas station at all. I currently charge the car twice per week and then do a couple of top up charges on a weekend. Statistics on my current tank say 325 miles at an average speed of 11mph and my fuel gage is still showing over ¾ full. Stats for this tank say I have done 281 miles in EV and 63 miles using gas. This nets out at a fuel economy of 181mpg. I have to say that I cheated a little on this tank. On two occasions I drove our Toyota Echo on longer trips, Once down to Marina Del Rey, about 25 miles round trip, and yesterday to Santa Monica, about 16 miles round trip. I did this because we run the Echo so infrequently that the battery does dead so when I have the opportunity to take it on a reasonably long drive I do. It should be noted that the fuel economy numbers given by the car do not include the energy used in charging so they are a little misleading if you are trying to figure out CO2 production or overall energy use. As I said above the PIP is not perfect. There are a few things that many people find off-putting. One of the biggest beefs that most people have with the PIP is the lack of a spare tire. If you have a flat then you pretty much have to call a tow truck. Toyota provide free towing in this situation for the first three years of ownership but they will only tow you to the nearest Toyota dealership who will more than likely want to replace the tire rather than repair it. They also supply a compressor and goop that you can use to fill the tire but this causes problems the tire pressure monitor. Some people have actually gone out and bought a spare tire they can take with them on trips. The thing I dislike most about the PIP is the way that the engine turns on at the drop of a hat. This is the design of the PIP; it is a plug-in hybrid and so the electric motor is not designed to be capable of running the car on its own in all circumstances. Still, some people get annoyed when they accelerate hard to merge into traffic and the engine comes on. There are those that pull over and turn their car off then restart which stops the internal combustion engine from running. I accept that the engine came on and let it run until the warm-up period is complete and it shuts itself off. Over time I have become adept at accelerating slowly enough to keep the engine off. There is even a screen on the PIP that helps with this. Still, there are times when the engine is going to come on and you just have to accept that. It should be noted that the PIP will start the gas engine if the car has been driven in EV mode for 200 kilometers (124 miles) without the engine starting. I have one other annoyance, the behavior of the EV remaining display. First I think that Toyota used a very optimistic setting as the starting point for its calculations. When you get the car new it starts out showing 13.5 miles of EV for a full charge. Over the year my miles per charge has slowly dropped until it stabilized and now shows between 11.0 and 11.3 miles for a full charge. This is very consistent with the 11 miles per charge on the EPA cycle. I think Toyota would have done better to use 11 miles as their starting point then if the range climbed they would have many happy drivers instead of drivers questioning if there was a problem with their batteries. My personal peeve is the way the range showing will go up and down when doing lots stop and go driving. Sometimes, when I am slowing down coming to a red light my miles remaining will go from say 6.1 to 6.2. As soon as I touch the accelerator to take off from the stop light the range drops back to 6.1. Obviously the range is right in the middle between 6.1 and 6.2 and drops back right away as soon as charge is drawn from the battery. This shouldn’t be unexpected and my annoyance is totally irrational but hey it happens. The PIP does have its strong points too. First is the incredible mileage. Even without charging you can expect around 54mpg in the PIP on a long road trip which is better than the 50mpg you would expect from the regular Prius Liftback. Even with just a few charges each week the amount of gas saved can improve dramatically. With the PIP you also get Toyota’s reliability. I know that my mileage is still pretty low but after one year I haven’t seen a single mechanical issue on the PIP. I do have a crack in the windshield and I am not sure why but more than likely it got hit with something kicked up off the road by a passing truck. I also get the joy of driving electric only as long as I can keep the battery charged. When I had the 2005 Prius I would have to work to keep the ICE off and then I couldn’t do it for long. With the PIP as long as the battery is charged and I am careful with acceleration I can drive in electric mode. Personally I like the smooth quite ride when driving EV and that is a big reason for my getting the PIP in the first place. The fact that the PIP is a plug-in hybrid means that even though the car may run out of EV range it will still run as long as there is gas in the tank. This makes the PIP ideal for those people who want a single car to do it all. With plenty of room in the back to haul stuff and reasonable comfort for 5 people the PIP is ideal for those like me who can’t live with a pure EV due to lack of charging capability at home. I did this evaluation from the point of view of an apartment dweller who does not have the ability to charge at home. I am lucky in that there are plenty of free charging stations near the places where I work and do most of my shopping and dining so I can charge up enough to keep my car in EV most of the time. If you can’t charge at home or at work, and you really, really want to drive an EV, then I would recommend the PIP or one of the other Plug-in hybrids from Ford or Honda. If you can plug-in at home then the choice will depend on your needs. If, like me, you have a very short commute then one of the plug-in hybrids is a good choice. If your commute is less than 50 miles round trip then your best choice, assuming that only having 4 seats works for you, is the Volt. 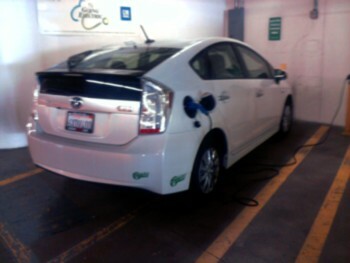 Above about 50 miles round trip then one of the other plug-in hybrids will work well. The longer your daily drive, the more you will benefit from the outstanding mileage of the PIP. I have no regrets about buying the PIP. It’s not the most fun car I have owned; that’s reserved for the Chevy Cavalier Convertible I owned for 14 years. The PIP is a workhorse car that is clean and reliable. It works for me and I enjoy driving it.